Adult-sized Hilarious HOLLY MISTLETOE HEADBAND measures approx. 12-inch (30cm) Tall. Our fun and festive holiday decoration themed headpiece features a covered velveteen or red flexible plastic headband decorated with plastic HOLLY MISTLETOE, featuring your choice of Red and White Ribbon with Marabou Feather Trim, or Red Metallic Tube with Felt KISS ME. The perfect Classic inspired UGLY CHRISTMAS SWEATER PARTY costume accessory for any of Santa's Elves and other helpers! Could you be more obvious about your Christmas wish? Great crafts projects base to wear as is, or add more decorations of jingle bells, ribbons, miniature Christmas ornaments, etc. 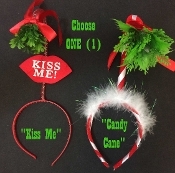 Material: Bendable Metal Wire with Plastic Holly Mistletoe on flexible Plastic headband. Care: Spot Clean only with damp cloth - DO NOT WASH.